Do you really own something that you are forced to perpetually make payments on and which can be seized from you if you don’t pay? I would say that you don’t. You would possess such an item, but you wouldn’t ownit—an important distinction. 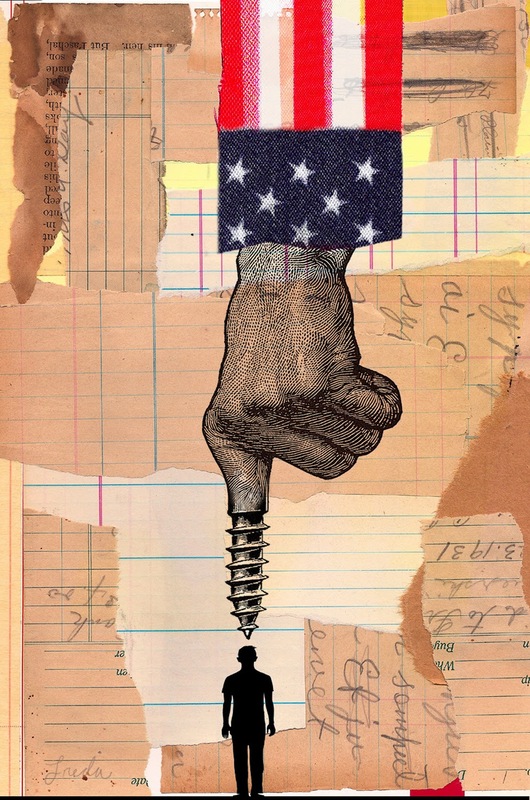 A ridiculous perversion of the concept of ownership and property rights has infected most of the world like a virus: something that most people unquestioningly accept as a normal part of life—like it’s a part of the eternal fabric of the cosmos. I am talking about property taxes, of course. You know, the annual tax you pay that is based not on whether any income was generated, but rather on the underlying value of real estate you supposedly “own.” There is no way to pay off this obligation in one fell swoop; it stays with you for as long as you “own” the property. In actuality, you don’t own anything which you must pay property taxes on—you are merely renting it from the government. Suppose you bought a sofa set and coffee table for your living room for $5,000 cash, and then had the obligation to pay $100—or a percentage of the furniture’s value—in tax each year for as long as you “owned” it. Then suppose that for whatever reason you’re unable or unwilling to pay your furniture’s property tax. It won’t take long for the government to swoop in and confiscate it to pay off your delinquent taxes. You get to “own” it as long as you pay the never-ending annual fee—stop paying and you’ll find out who really owns it. While many people would correctly find a furniture property tax absurd, they also illogically find it acceptable for the government to levy an insatiable tax on different assets—namely their homes, offices, and raw land. But to me at least, the type of asset being taxed is not what makes it absurd, it’s the concept of property taxes that is absurd. Respect for property rights and property taxes are mutually exclusive concepts. What’s yours is yours, and you shouldn’t need to pay the government for permission to keep it. It’s not uncommon for people in North America and Europe to pay tens of thousands of dollars per year in property taxes … just to live in their own homes. And this burden will almost certainly continue to rise. Property taxes are constantly being raised in most places, especially in places with poor fiscal health. It’s very possible that over a lifetime, the total amount of property taxes extracted will exceed what was paid for the underlying property in the first place. And, just like the furniture example above, if you don’t pay your property tax (AKA government rent) on the home you thought you owned, it will be confiscated. This is not as uncommon as some would believe. It was estimated that 10,000 people in Pennsylvania alone lose their homes annually because they aren’t able to keep up with the property taxes. Using the word “own” and “ownership” in these contexts is the sloppy use of the word—which always leads to sloppy thinking. Speaking of sloppy thinking, expect Boobus Americanus to say things like “how would we pay for local services like public schools if it weren’t for property taxes?” Of course, these services could be funded in many different ways—or better, they could be provided for in the free market. But don’t expect that to happen. In fact, given the social, political, and economic dynamics in the US and most of the rest of the West, expect the opposite—property taxes have nowhere to go but north. It doesn’t have to be this way. 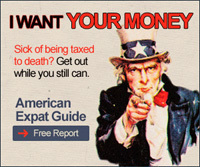 You can own real estate in certain countries and can skip the annual property-tax harvest. I have previously written that I view real estate in foreign countries—along with physical gold held abroad—as superior vehicles for long-term savings. However, foreign real estate has its drawbacks. It’s illiquid and has carrying costs like maintenance expenses and, of course, property taxes. To diminish these costs that eat away at your real estate investment, it is essential to minimize or eliminate them. That’s it. If you want to escape the rapacious and ridiculous property tax, these are your options. Ireland would have been on this list, but it recently adopted a property tax. This does not bode well for other EU countries that conceivably could face fiscal troubles and turn to property taxes as a solution—like Malta and Croatia. Colombia, Costa Rica, Ecuador, and Nicaragua have property taxes, but the obligations are generally negligible. The risk, of course, is that since a property tax is already in place in these countries it can easily be increased whenever the government decides it needs more revenue. Case in point: the bankrupt government of Greece. Consider the excerpt below from an article in The Guardian. The joke now doing the rounds is: if you want to punish your child, you threaten to pass on property to them … Greeks traditionally have always regarded property as a secure investment. But now it has become a huge millstone, given that the tax burden has increased sevenfold in the past two years alone. 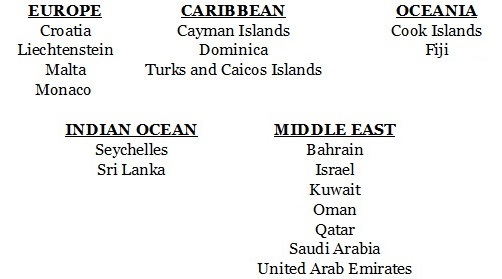 The country on the list above that most interests me is the Cayman Islands, but to each his own. This is because most Caymanians are vehemently opposed to all forms of direct taxation and have never had it in their history. That attitude and history is a good guarantor that it will be very unlikely for a property tax to be imposed sometime in the future. In any case, buying foreign real estate is a very individualized and often complex decision—but one that provides huge diversification benefits. Property taxes are but one consideration. You should look at foreign real estate less as a vehicle for a quick return and more as a diversified long-term store of wealth. Wherever you decide to buy, it should also be in a place that you would actually want to spend some significant time in. That way, the property has value to you, regardless of whether it proves to be a good investment. One expert on foreign real estate whom I’d highly recommend is none other than Doug Casey, the original International Man and my mentor. Doug’s been to over 175 countries and invested in real estate in a number them. He wrote a thick and detailed chapter on foreign real estate, including his favorite markets, for our Going Global publication, which is a must-read for those interested in this extremely important topic.